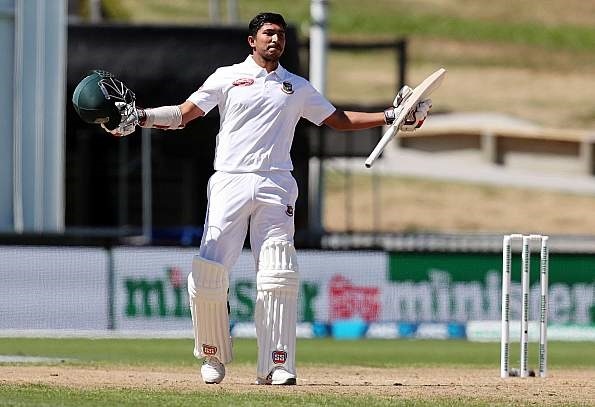 Soumya Sarkar hit his maiden Test ton from 94 balls, equaling fellow Tamim Iqbal’s record of fastest century by a Bangladeshi in Tests during the fourth day of the first Test against New Zealand in Hamilton on Sunday. Shine with ball taking two wickets, Bangladesh also need him to perform with the bat. With 39 overnight score the left-handed batsman reached his fifty from 60 balls. The three figure came when took a single on the leg-side off Tim Southee to bring up his first Test century. Southpaw opener Tamim Iqbal had long held the record as his own when he struck 100 off 94 deliveries against England at Lord’s in 2010. Bangladesh started the day at 174 for four, trailing New Zealand by 307 more runs. While the runs on the board will not matter given New Zealand’s massive first innings lead, Soumya together with his skipper Mahmudullah Riyad paired 235 runs for the fifth wicket stand to deficit the defeat margin. Soumya’s classy innings 149 runs off 171 balls contained with 21 boundaries and five over boundaries. His marathon innings finally stopped after Trent Boult made him a clean bowled.